Earlier this week, we came across a video of an orb-based eyeball that would follow you throughout the room, based on data gathered from a Kinect sensor. Try as we might, we couldn’t find much more than the video, but it seems that the guys behind the project have spoken up in a recent blog post. 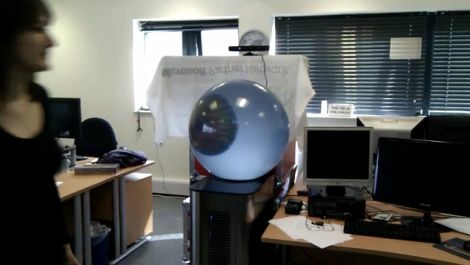 [Jon George] of The Design Studio UK explained that the person-tracking eyeball visualization was built using a PC, a Kinect, and a product called the Puffersphere, which projects a 360 degree image on the inside of a glass orb. A panoramic image is converted for use by the special lens inside the sphere by applying a filter which warps the image into a circular shape. After the image has been created, a simple Windows app is used in conjunction with the OpenNI framework that allows the image to follow you around the room. The only problem with this fun little project is the price of the sphere – we’re not sure what it is exactly, but rest assured it is more than we are willing to pay for such a toy. We’re thinking there has to be a way to simulate the orb’s effect to some degree using cheaper hardware. It’s possible that it could be done using a small-scale DIY version of this spherical mirror projection build, though it consists of concave half-spheres rather than full orbs. In the meantime, take a look at these two videos of the orb in action. Don’t worry – we know you were totally thinking about the Eye of Sauron, so the second video should not disappoint. Wow, what an awesome display. That seems like a really niche product. I can’t imagine any practical uses that would warrant such a high price. Every Sysadmin needs to put one of these in EVERY user work area. BOFH to the Nth degree! servo’s, a huge pingpong ball and an lcd projector mod? Two things: First, what the hell is a Super Umami lens? I searched for a while and couldn’t find any references to it. Second: Touchscreen? How many orders of magnitude cooler would this be if it were interactive through a multi-touch interface? The width of your iris depends on the lightning conditions, not on the focus of your eye. i agree with a previous poster. ptz pico projector in some kind of huge ping pong ball? maybe blow up beachball? at work i have a ptz camera with motion tracking. ive wanted to do the eye form LOtR. it is already creepy having it follow you around the room. but the eye would make it better. When I first saw it, I thought they just had a sphere with an eye on it that they were moving with rollers, like the reverse of a trackball. That might be the solution to doing this cheaply. would it be as cool with a POV globe?